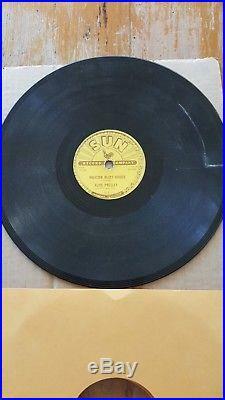 Elvis Presley original Sun record 78 215 Milk cow blues boogie/you are a heartbreaker - cracked record original, NO REPRINT, NO counterfeit. Placed on 78 rpm player it will play and not skip. We recommend it as a display copy. Priced to sell due to rarity of original record. 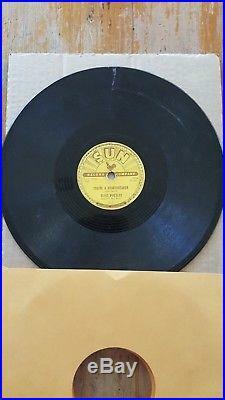 We are going to list also complete Elvis Presley original 78 rpm Sun collection soon. 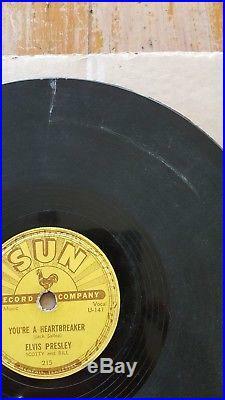 The item "Elvis Presley original Sun record 78 rpm cracked 215 Milkcow blues boogie" is in sale since Friday, August 31, 2018. This item is in the category "Music\Records". world" and is located in Bedford, Western Australia. This item can be shipped worldwide.